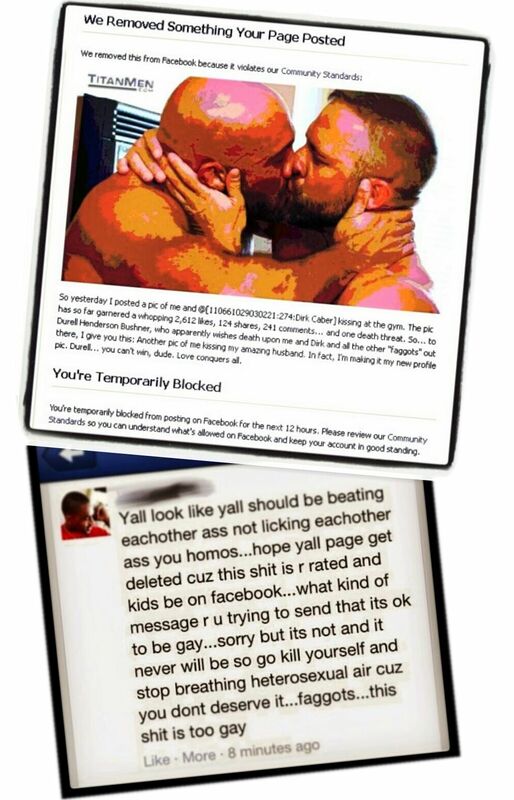 While my husband Jesse Jackman has been spending the last two days fighting back — successfully — against certain bullies cowards who would have his Facebook page taken down, I’ve been alternating between shooting a scene for Raging Stallion Studios and drafting this post while sitting in their breakroom wearing nothing but a jockstrap. À la Benjamin Franklin quipping that if he’d had more time he’d have sent a shorter letter, I’ll just post what I’ve already written on the matter and hope for the best. These bigots and bullies are people who (despite Christ) are anxious to cast the first stones in order to deflect attention from their own weak and limping lives. Especially by being on Facebook, however, they live in the most transparent of glass houses. For the vast majority of us who are the objects of their attacks, our houses are intact… because although we find their beliefs foolish and hurtful, we don’t go around baiting fundamentalists and homophobes into dark alleyways and beating them bloody. Their actions speak for their stunted character and the weakness of their minds; few of these hate messages are couched in any sort of decent grammar or spelling, and none have any more cohesive logic than soundbites and doggerel can convey (the impotent “Adam and Steve” barb leaping to mind). Name calling, argument ad hominem, and violence, real or threatened, are the last resorts of cowards when they know they’ve lost the argument. We as gay men and women have no need to make anyone feel small just so we can feel big. We ARE big. We’ve been here since the beginning of time and history, present in every society on earth and huge contributors to intellect, humanity, and civilization. We are capable of committed love, of being part of our families and creating new ones, of relating to a spiritual higher power, and of being true friends to anyone who would befriend us. We will be here until the end of the world and probably beyond, and we are proud to show the world all of this on Facebook or in any of our glass houses. Let these other people go and shatter their own homes with their “I am without sin” stones if they think their religion demands it. They have no right to break ours. And the pigs that squeal the loudest are the ones that know their time is just about up.